A few people have tried to rewrite Minetest history. It's not uncommon in real life or online. It's always funny because, you know, facts are facts. You can't just swish a magic broom and then the facts are gone. But it doesn't stop people from trying. The Old Coder has been active in Minetest for a significant chunk of his waking hours outside of work and legal cases for 7 years. People have forgotten how long the Old Coder has been at this. Just for fun, here are some posts from 2012 through early 2013. More screenshots from the period exist and will be worked in. Updated minetest_game to current git version. Updated Vanessa World. Most worlds are connected to IRC now. Vanessa was Vanessa Ezekowitz, one of the most important figures in Minetest. She reverted to her maiden name, Vanessa Dannenberg, after the death of her husband Abe in Fall 2017. Replaced gloopores with glooptest. Patched existing mods to work with glooptest. Replaced glomie protector with Zeg9 version of the same mod. Added Animals, Craft Guide, and IRC support to most worlds. Updated RBA Technic, Kaeza IRC, Vanessa Pipeworks, and Zeg9 Skins mods but preserved existing skins. RBA was short for Real Bad Angel, one of Maciek Kasatkin's personas. This is a bit more about RBA below. Kaeza was Diego Martinez of Uruguay. Mark Twain world: Added Peaceful NPC, Waterpush, and Workbench. Mark Twain world: Replaced protector with randomproof node_ownership. Additional tweaks to Mark Twain world. Added Chains by Doc22, Diamonds by Infinity Project, Utility by Keriz, and UFOs by Zeg9 to one or more worlds. World 30000 has an official name now: AngelFury. Added Conifers by Vanessa to most worlds. Connected some worlds to IRC using Kaeza IRC mod. Sapier1's animals are now being tested in the Octuteam world. I asked Sapier1 to prepare a stable snapshot of his mod and he was willing to do so. The changes were appreciated. A new world, Mark Twain, is now live on port 30010. The OldCoder Server Nexus has been updated to Minetest 0.4.4. All 18 U.S. worlds. The Europe world will be updated later. Please test the worlds and report any problems. Computers have been added to most worlds. The mod is by Kaeza. (a) The Server Nexus was an early collection of 19 worlds, many of them created by people who didn't want to run them any longer but didn't want them to die. The collection was named by NakedFury, an early Minetest figure. (b) OldCoder paid for a Europe VPS specifically to run Minetest for European gamers who'd requested it. I've added a new world, as yet unnamed. This world includes V.E. 's house, shown in the screenshot below. It's for demo purposes only. The world won't have interact for a while as V.E. is still working on things. * Added Bridges by Sokomine. Made a minor fix suggested by Baby Face. * At Vanessa's suggestion, patched 3D Forniture to remove Rounded Trees and 3D Papyrus. This should speed up things a bit. Also removed Repair Trees as it is only needed if Rounded Trees are used. Octupus was one of the aliases, or personas, of Maciek Kasatkin, also known as Real Bad Angel, Landmine, Misael Roman, The Red Mood, and Jordach. * Added Places mod by Zeg9 to most worlds. This mod allows players to record locations and descriptions of their places. * Added Inventory Improved mod by Zeg9 to Zegaton. Similar to Places but not compatible with Inventory Plus. * Removed TNT from Zegaton at Zeg9 request. Also added Ghostash player avatar. * Added a new world: Zegaton. This is Zeg9's world, which I'll be hosting now. Presently located at 30015. * Added a new world: Veritas. This is a large creative world. Presently located at 30014. * Patched Inventory Plus to fix a crash. Updated Farming Minus, Gems, and GloopOres. Added a new world: Harbor. Alternate Tux World has been successfully regenerated and buildings have been moved to the new terrain. * Added Gems by NekoGloop. * Replaced all farming in PilzAdam world with Farming Minus. * Updated Octublock. Dropped Octuwater for now at Octupus request. * Switched to Real Bad Angel version of More Blocks for the time being; this version fixes a recipe issue. Updated Octublock. Tested WorldEdit //metasave and //metaload against LevelDB; no problems observed so far. Real Bad Angel world was damaged by lava so we reverted to a backup copy. * Several worlds have been converted successfully from SQLite3 to LevelDB including the largest of the current worlds, Calinou World. Some problems in the conversion procedure have been corrected with thexyz's assistance. * Technic has been updated. The Octublock and Octucard mods have been added to the Octuteam world. The Octuteam world seems to be stable now and coming along nicely. * The Octuteam world died. However, converting from SQLite3 to LevelDB seemed to help. The world is back though the castle hasn't been reconstructed yet. LevelDB was actually a bad idea due to frequent corruption. It's recommended that anybody still using LevelDB for Minetest migrate back to SQLite3. * WorldEdit has been updated to fix some bugs. * DokuTest has been updated to support Gloop Ores and More Ores. Node Owner has been dropped for now. * Updated Technic. Removed item_pickup and timber from Technic worlds as it now obsoletes them. Added a Technic related patch to the default mod. * Additionally, built a Debian version of both the Minetest server and the client. This release adds Taoki's anaglyphics feature. * Built new Windows Minetest client programs. This release includes a filters patch by Vanessa, preloaded media, a copy of minetest_game, and updated mods. * Fixed some crashes in Town Test. Added new textures. Updated Mesecons and Snow. Thexyz repaired database damage in the Calinou world. * I'm hosting the Calinou world now. * Added new mods to OldCoder modset: Animated Water, Bookmarks, Colored Wood, Hydro, Node Ownership, Set Home, and World Time. Some of these also went into the SkyCoder modset. * Updated Ambience; there's some new music. Also updated redsand. Added Bones and Map Tools to the Calinou world; they aren't used elsewhere yet. * Updated Home Decor and Technic. Added a new world: HolaMundo. Lots of Minetest news today. * There's a new Windows Minetest client program available for download at minetest.org. This program is faster than the old series and is also loaded with mods for offline use. * I set up a Minetest server in Europe at europe.minetest.org. This one is hosted by anunakki. 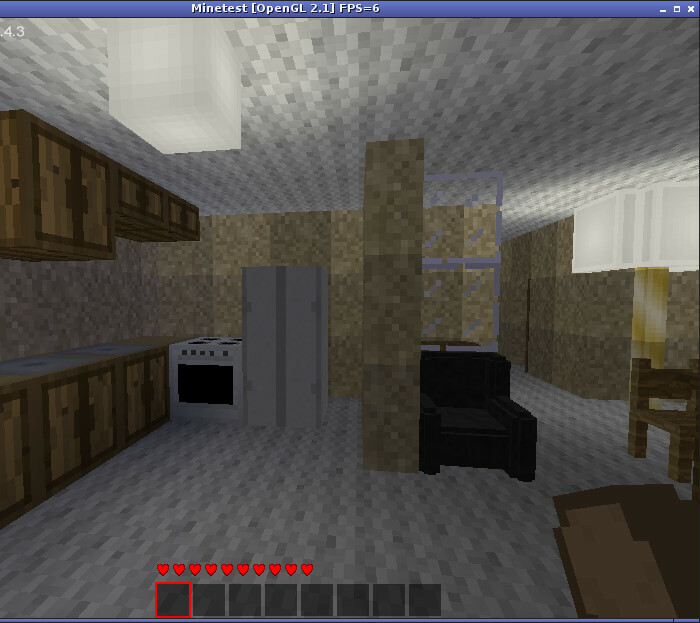 * Added a new Minetest world based on PilzAdam's minetest_game fork. * Replaced Old Tuxworld with the Tuxworld that mrtux had been running on his Windows server. * Added sound effects and music to most worlds. In other words, Ambience. Note: This change means that the client program will take longer to load the first time it is used. However, it should load at normal speed for subsequent runs. * Added mods to the OldCoder modset: OctuWater, PilzAdam Clouds, and PilzAdam Signs. * Updated Technic. Dropped carts for now as they have two problems: they lock up on stairs and they contribute to lag on servers. * The MineTest Server Nexus is now located at minetest.org. * Added mods to the OldCoder modset: Farming Plus and Town Test. Also added DokuTest textures provided by NakedFury. * Updated mods: Farming, Home Decor, Mesecons, Technic. Replaced Jeija's version of Throwing with PilzAdam's version. * NakedFury has dubbed this collection of worlds the “OldCoder Server Nexus”. * Fast is now on by default and has been granted to existing players as well. Anticheat mode has been disabled to bypass some possible bugs. * Added a new world: Puzzle Islands. Added a mod to the OldCoder modset: Teleporter. Extended worlds framework; mods can be updated more easily now. Added more screenshots to the worlds web page. * Due to griefing, the servers are now whitelisted. Additionally, the Interact privilege is no longer enabled by default. * The servers now restart automatically after crashes. * The server construction procedure now provides for patching mods. Added some patches. Added mods to the OldCoder set and SkyCoder modsets. * Removed fire mod from all worlds as an attempt to reduce crashes. Added a new world: Mazebint. * Rebuilt the AWS EC2 instance from scratch and documented all steps involved. Switched from EC2 Micro mode to EC2 Small mode. Updated to latest Skyblock. * Dropped armor for now since it complicates PVP mode. Added mods to Skyblock world. Added Fast to default Skyblock privileges at NekoGloop's suggestion. Created a new Amazon AWS EC2 instance. Compiled Minetest 0.4.1 and 0.4.3 on the EC2. Built Minetest 0.4.1 and 0.4.3 server trees. Added two 0.4.3 worlds (default and Skyblock). Added one 0.4.1 world (Tuxworld). Started a Minetest webpage.